Healthy pumps, fans, compressors and other motor-driven rotating equipment are essential to the efficiency and safety of fluid systems. 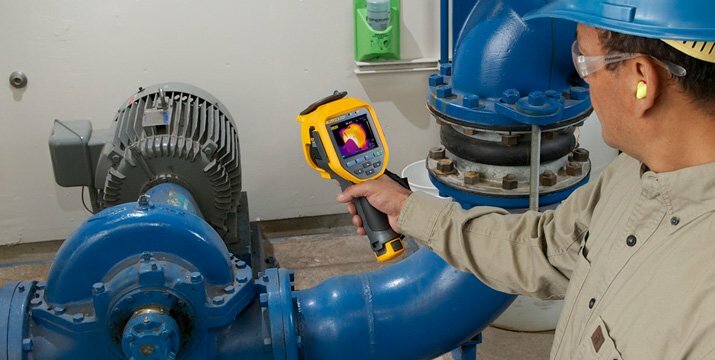 Thermal imaging is a great front-line tool for monitoring rotating equipment because you can stand at a distance and scan the equipment while it’s running. Overheating is a major predictor of impending failure so the infrared scans can point you to problem areas. The key things to look for are hot spots or differences in temperature between similar units that are operating under similar conditions. Set up a regular inspection route for all critical rotating equipment and then save the images and data you gather on your PC. This will give you a baseline for future comparisons and strong evidence to back up your recommendations for repairs. Equipment conditions that present a safety risk are the highest priority for repairs, followed closely by imminent failure of any critical pump, fan, or compressor.